Every girl wants to look exceptional on Christmas Eve. That is why you need to ensure that your little girl is fully equipped for this happy holiday. Various Christmas designs and styles embodied in festive outfits for girls are provided by a great many of fashion designers who specialize in creating exclusive outfits for little girls. Make a change and get the best out of the best. You will surely find something exceptional for your little princess to look great and feel comfortable during Christmas holidays and during the whole winter season. If you are also looking for fashionable accessories specially designed for the Christmas time, you will find them on our website. We offer clothes, footwear and accessories for winter time provided by the world-class designers specializing in kids’ fashion. You will find a great assortment of lovely shapes and colors that will brighten up the looks of your little girl and will make her look great and feel no discomfort during winter. When the weather is nasty and cold outside, every child should be fully equipped for the weather conditions. Our range of girls’ wear ensures maximum comfort and freedom of movement of little girls during various entertaining winter activities outdoors. You will be pleased with the quality and style of every piece of clothing as they are made of the finest fabrics and high-quality materials to ensure safety for the health of little children. Every piece of clothing is embellished with a great many decorative elements that will make your child fully equipped for the Christmas festivities. Such outfits will ensure a Christmas mood of your child and make her happy with such a bright and colorful outfit for the Christmas holidays. Don’t hesitate to look through the Christmas assortment of girls’ wear to find something really exclusive for your baby girl! Boys enjoy Christmas holidays as during this time they can get engaged in various entertaining activities outdoors like playing snowballs and other winter games. However, every little boy should be fully equipped for the winter time in order to feel comfortable while playing outdoors especially if it is Christmas time. 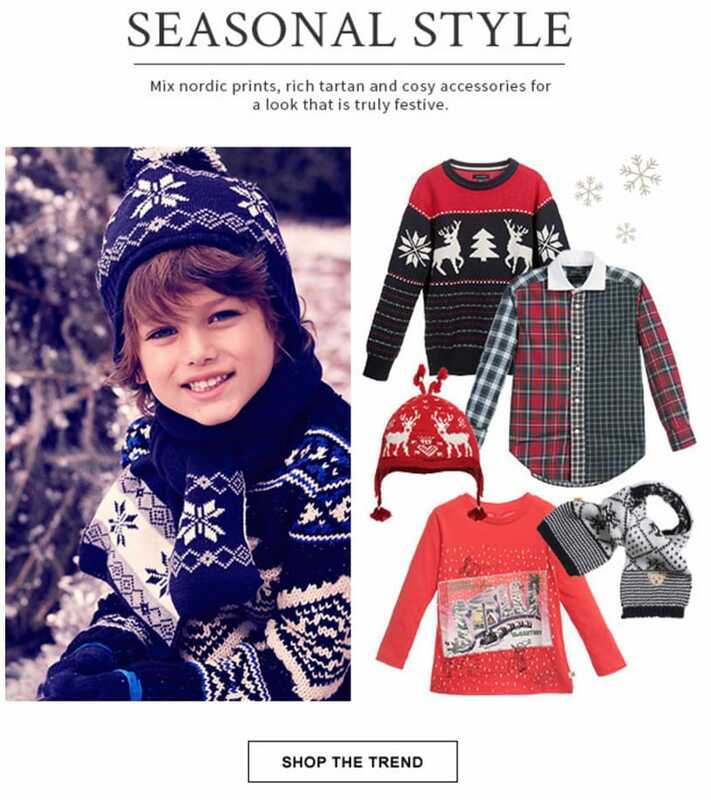 Your little kid will be happy to wear festive and dressy outfits embellished with Nordic patterns during Christmas. This will elevate his spirits and make him feel good in the clothes he is wearing. If you want your child to feel comfortable and at the same time look his best, choose some of the festive designs presented on our website. Checkered sweaters, Nordic hats, warm gloves and many other clothes and accessories are available for a highly affordable price. Whether it is a home Christmas dinner you are getting ready for or entertaining winter activities outdoors, your child will be happy to wear some of the exclusive clothes and accessories offered by the leading providers of boys’ wear across the world. Every boy will enjoy wearing clothes embellished with festive patterns and cute little details that are especially designed for the Christmas time. All kids’ wear is made of the top-quality fabrics and thoroughly chosen materials the quality of which will not leave you indifferent. Don’t hesitate to make the right choice and find something extraordinary for the Christmas time to become a favorite holiday of your child. This will be the best gift for the holidays and the chosen outfit will keep your child warm during the whole winter. Check out the fantastic collections of winter outfits for boys presented by various renowned designers who specialize in boys’ wear and do their best to provide exclusive designs and styles for your child to feel great and look his best during winter holidays.